Lighten your load my boy! Lesson number ONE - must be pack weight after the last 2 days on the PW. The first outing we reconed we had roughly 7kg.. this is an estimate, not weighed. If that was the case then this weekend was 9kg+... Ouch. So what happened with the increased weight? The weight of the pack was too much, it bounced from side to side. The pack was unstable when running. And the running, unless on the flat or only slightly uphill was tough, really tough. We only ran when it was flat, a slight uphill gradient or downhill. Oddly enough, downhill was the worst. Because we had too much weight in our packs. Speaking to Joe Faulkner, who many know as a master at Mountain Challenges and more, let me into his thoughts on what the Spine was all about. I was sitting in the pub with Joe, getting the low down on some Navigation Courses he wanted me to cover for Nav4 Adventure. We got onto the Spine. For those who don't know, Joe is on the safety/medics team for the Spine and this makes me happy. Joe is dependable. Joe really knows his stuff. He said "For those who want to complete the Spine, un-supported, they must apply a Mountain Marathon frame of mind and attitude." I think he is right. Not that I would want to argue with Joe, but what he said made complete sense. 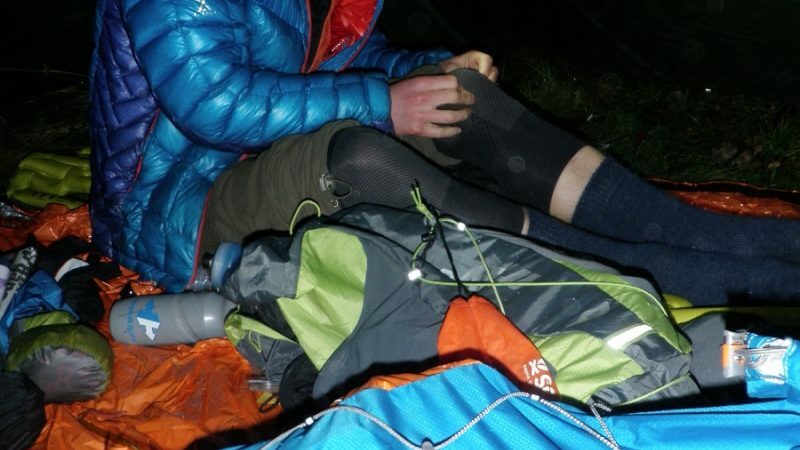 By a Mountain Marathon attitude, Joe meant, you must pack light in your day bag, as light as you think you can get away with, whilst making sure your not breaking the rules or putting yourself into danger if injury is sustained on the race. Mountain Marathon is the way I was thinking, but I didn't get it right for last Friday and Saturday. Joe even suggests your 60L kit bag on the Spine, should majorly be full of food... I'm taking real good heed of this comment and will be taking quite a bit of time to work out the calorific content of each meal and what I think I require. On the Dragons Back Race I ate like a horse. The food was supplied. Had I needed to supply my own, my whole kit bag would have been full of food. The DBR was in September, the Spine Race is in January... I think my kit bag will be bursting at the seams. Thursday evening, we caught the train to Edale. 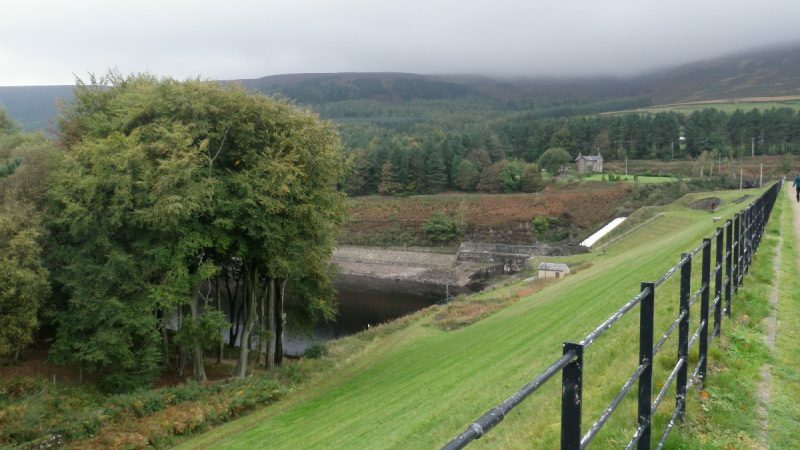 Stopped in the pub at the head of the valley and set off after a couple of pints to camp just short of Jacob's Ladder. We found a great little spot, just by the river, just big enough for my extra roomy Shangri-la 3 Go Lite shelter... In order to take this extra weight, we fore-went a ground-sheet and used our emergency bivvi's as ground sheets and I used a Rab Survival Zone Bivvi as my outer layer to stop the damp. This worked well. 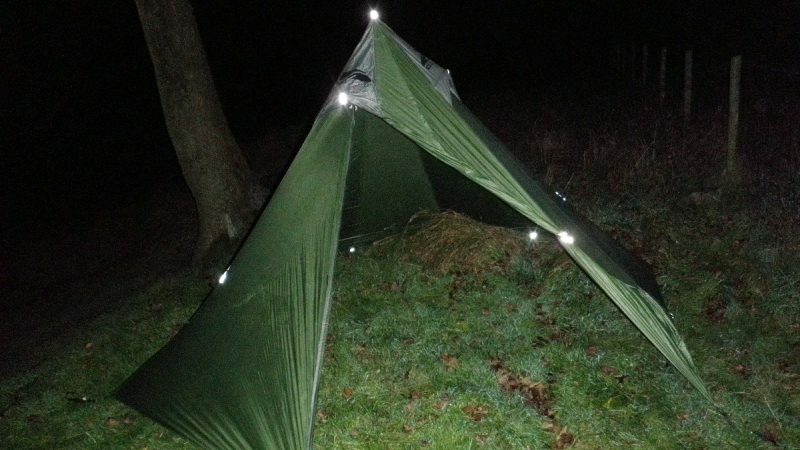 The Go Lite Shang 3 is 650 grams for the Flysheet & 310 grams for the pole, we didn't use the pole on the first night, suspending it from a tree, we might be able to go without the pole... this is a plan. We will use Mountain King Trail Blaze Poles, strapped together, in order to make a central pole.... This will save weight. We woke at 5:30am Friday, and we're on the trail by 7:10am. Getting going is the hardest part sometimes. 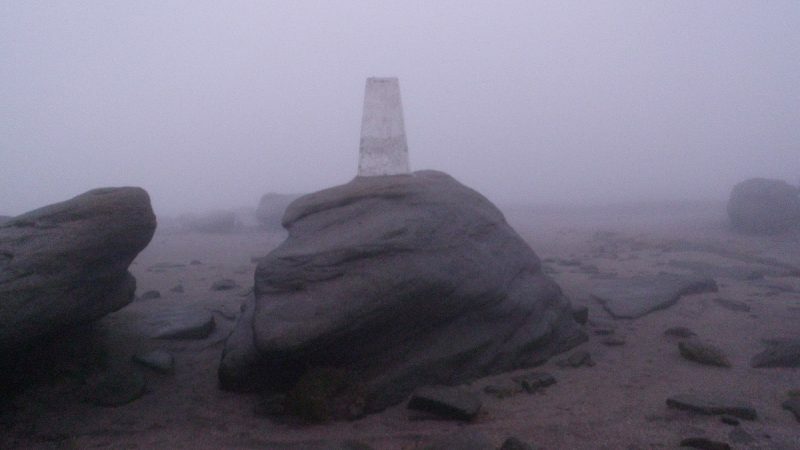 Kinder Scout was soon under foot and the yellow brick road started. Paving stone after paving stone. You might think its nice, but for me its like running on concrete. Pound, pound, pound... thats what my legs felt. Of courses they felt good to start with, but that was to change later in the day. 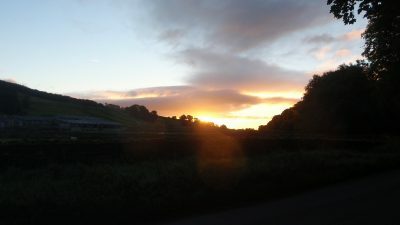 The weather had been great Thursday night, bright full moon, little cloud, the promise of an ok day, if you hadn't looked at the weather forecast. I knew clag was on the cards. So we entered the CLAG. Wonderful, vision restricted to 100m max, down to 50 or less at points, a little bubble, all of our own, just for us to go mad in! 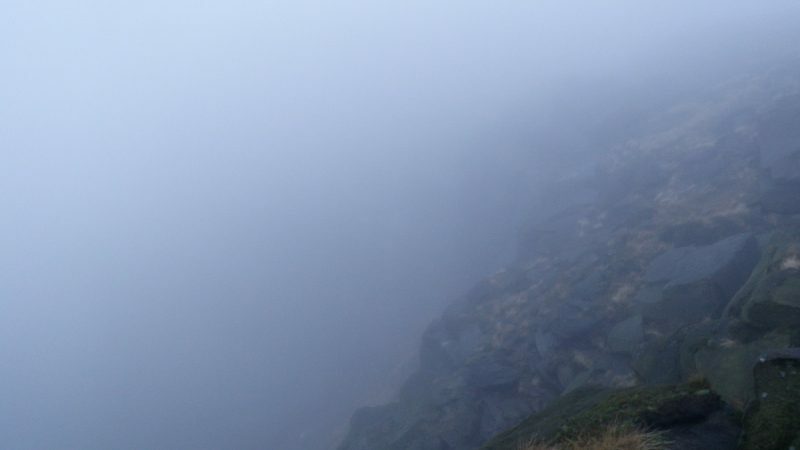 A day in the clag is not the best, especially when its a long day. 45 miles in zero vis. is enough to noble the toughest of us, mentally and its the mental side which counts in endurance races. If you ain't got it up there, you ain't gonna complete. Forget the physical, its the mental that says win or lose sucker. The physical will keep going, until the mental gives in! 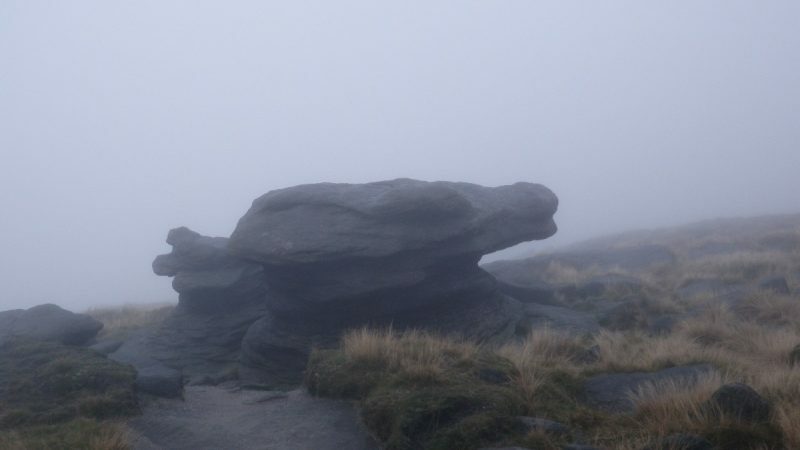 The section from Edale to Hebden Bridge seemed very tedious. I don't know if it was the wight of the pack, the clag, the paving stones or the fact I was blowing green lumps out of my nose!! 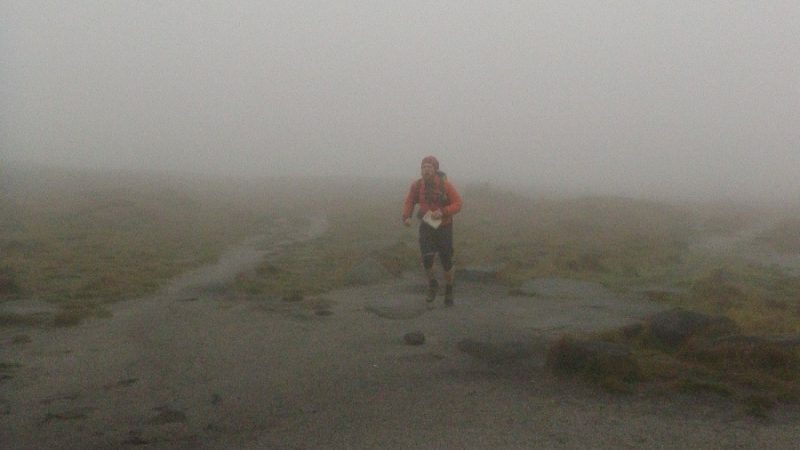 My body was getting hammered, the weight of the pack, plus VivoBarefoot Trail Shoes... Lesson TWO - Get your shoes sorted! We'll come back to that in a minute. The pack on the last recce was fine, my shoulders didn't seem to feel it, but this time after 15 miles, my shoulders were hurting, only had another 30 to 35 miles to complete today!! I'm having trouble with shoes. I wore my Inov8 Mudclaw 265's last time, then realised there wasn't any mud for the claws, to claw. Most of the moorland is on paving slabs, big sandstone paving slabs, like the yellow brick road. Plus the 265's were too small, they crushed my little toe under the other toes and gave me a blister. My sock combo was wrong as well, so I have to take this into account. Since I have started running forefoot all the time, my feet have not been happy in previous shoes. It might be the design, it might be that they are now all to small, as my feet have spread. It might be that my foot is doing different things in the shoe when I foot strike. Its most likely all three. The 265's didn't work. I've thought of buying a bigger pair, but in true style of a natural runner, I took the VivoBarefoot Trail Shoes for this recce. After all its only 100 miles in 3mm of rubber with a 9kg+ pack on my back, what's the problem with that!! After 20 + miles my feet let me know the problem. Most likely a Fairfield Horseshoe round and quick 6 mile trail run, in my Luna Venado's didn't help the bruising underneath my Met-heads! So my feet complained. I told them to go away. We continued. We made it 45 miles in, 5 miles south of Ponden Reservoir. There was a pub, the calling was too great and we jumped inside, for some warmth, some food and some beer! 05:30am, 6 hours sleep. Just enough, but the 2 pints of beer might have been an error, felt pretty sluggish. We got moving, but it took us too long, we were on the road by 07:30am. The plan today was Hawes. 50 miles away. This seemed improbable, but you must get on, see how you feel and keep moving. Really important, always just keep moving, whether slow of fast, forward motion will get you there quicker. The day wore on, it seemed like we were moving well, but each time we did a time check, we realised we were moving like snails. My feet were really hurting, the paving slabs were punishment and the clag was on us again. 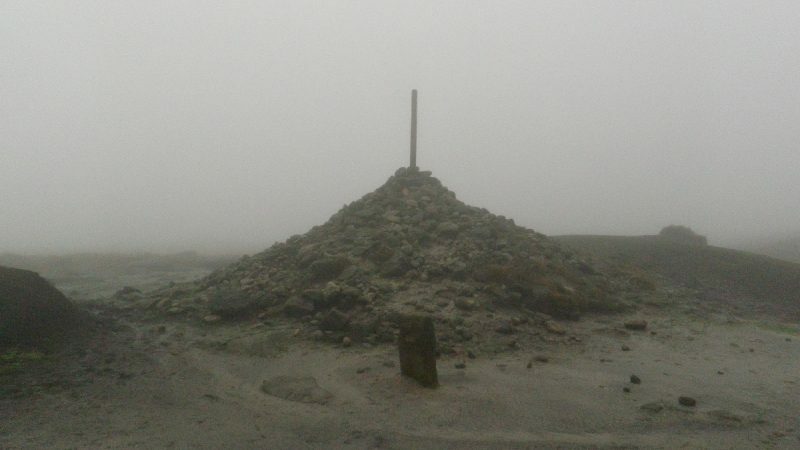 Thankfully the clag left us as we descended from moors into the lowlands of West Yorkshire. We made Gargrave at 3pm, we'd been hurting for hours. Its only training, and its only a recce. You have to remember these things. Lesson Three - Remember its only a recce! Lets have a conditions report. My left calf was blowing near the back of my knee, no doubt the extra weight in my pack and 100% forefoot striking. My left Achilles was tightening too much. My right IT band on my knee was giving me quite a bit of jip and every so often, my left one did as well. My body was aching, I didn't feel my best. Sometimes its right to soldier on, other times is best to know when to call it a day. Mr Burton was having issues as well. We canned it after 22 miles, in Gargrave. The sun was shining, finally the day had come out and we were beat, oh well, not bad to take off our shoes and sit in the sun for a while. We had earned it after 70 hard miles. Navigation on the PW is not difficult. As long as you have basic navigation skills imprinted in your mind, you can navigate the PW. On the tops there are lots of yellow paving slabs, big wide paths and the odd finger post. In the lowlands it gets slightly more technical. All you have to be in confident in your ability to navigate. What you need to look out for is direction. We took one wrong turn on day 2, tired and bothered, we headed up the Lancashire Canal, too far, so had to re-join the PW. When we did this, we didn't check our direction. Wham, just like that we were going the wrong way. All it would have taken was a simple compass bearing, yet we switched off and screwed it. Thankfully it only cost us 1.5 to 2km and some lost time. It did however demoralise us.... 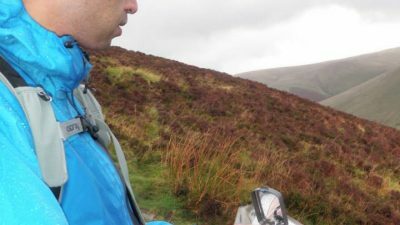 The lesson here is GET THE COMPASS OUT and always take a quick bearing, just to orientate the map and get your direction right is simple navigation, yet its very easily forgotten, especially where you don't think you need it, in the lowlands. What I have forgotten to mention is I forgot some kit, Essential stuff. I forgot my socks and I needed a few extra bits of food to add to my days, gels, shots, that type of stuff. Thankfully Andy leant me a pair of socks until we got to Marsden. On the way Andy called Simon Taylor from MountainFeet. Simon is the head honcho at MountainFeet, a specialist boot fitter/retailer. Being a real star, Simon decided he would close up his shop and meet us on the moors crossing above Marsden, he brought Clif shot blocs, caffeinated shots, bars and Inov8 Elite socks, what a fantastic guy. One of his staff is doing The Spine, another idiot like ourselves.